One of the things I like about winter is the hearty and comforting foods we make. Braised short ribs certainly fit that description. 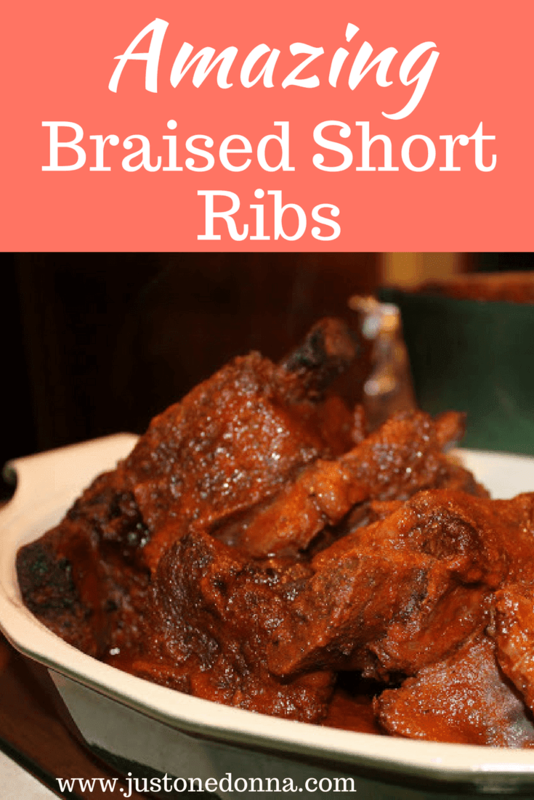 You'll love this braised short ribs recipe where the beef short ribs are cooked "low and slow" in your oven. This post contains affiliate links for your convenience. I receive compensation when you shop using these links. Short ribs may sound fancy schmancy, but in reality, they are amazingly easy to make. After a few preparatory steps, they are a "set in the oven and forget" kind of meal. Short ribs are also terrific to make in advance because they taste delicious when reheated. That makes beef short ribs an ideal dish to take with you for a potluck dinner that you want to be special. Short ribs make a perfect dish for a family dinner and you won't have to spend all of your time in the kitchen. Think how delicious the house will smell as your Sunday dinner cooks slowly in the oven. One of the fun things about this recipe is making a paste of the vegetables used in the sauce. You can dice the vegetables and made a chunky sauce, but making a puree of the vegetables means you'll have a smooth, rich sauce. The result is a lovely, yet robust sauce that pairs well with those mandatory mashed potatoes you'll be serving on the side. You should note that this recipe includes a hefty portion of tomato paste, resulting in a rich tomato base to the sauce. You can also make a yummy pot roast with this recipe by substituting a chuck roast for the short ribs. It's perfect for a yummy, but more economical, special dinner. Season the short ribs well with the kosher salt. Heat two tablespoons of olive oil in a heavy pot over medium high heat. An enameled cast iron dutch oven is a really great pot for this recipe. Get the oil very hot and add the short ribs to the pan, browning each side of the ribs really well. It is important not to crowd the ribs in order to get a nice sear. Remove the ribs from the pan when browned. Drain the fat from the pan. Preheat the oven to 375 degrees F. Place all of the vegetables in your food processor and puree until you have made a paste. Add olive oil to the same pan in which you browned the ribs. Add the vegetable paste. Season with salt. Cook the vegetables until they have browned and started to coat the bottom of the pan. Cook and scrape, being careful not to burn the vegetables. Add the tomato paste to the pan. Cook the tomato paste with the vegetables for about five minutes. Add the wine, stirring to mix the vegetables and wine. All that browned yumminess will mix with the wine and enhance the flavor of your short ribs. Cook to reduce the mixture by about half. Add the two cups of water, thyme, and bay leaves to the pan. Stir to combine. Add the ribs to the pan. Don't you love the steam coming from the cooking in the two pictures above? I can almost smell the yumminess cooking! Cover the pot tightly and cook for three hours in the preheated oven. Check periodically and add additional water to the pan, if necessary. You can remove the cover for the last 30 minutes to thicken the sauce. Remove the ribs from the pan and skim any fat from the top of the sauce. Serve over yummy mashed potatoes with the braising liquid as a gravy.